Last week, the United States attorney's office in Manhattan sent letters to about a dozen of the city's most important landlords such as Avalon Bay Communities, The Related Companies, the Durst Organization, Rockrose Development and Silverstein Properties and their architects noting that some of their buildings were not accessible to people with disabilities and therefore discriminatory under the Fair Housing Act that was passed in 1988. City and real estate officials are arguing that compliance with Local Law 58 satisfies the federal requirements. About 100,000 rental apartments and thousands of condominiums have been erected in the city since the law went into effect in 1991. The city's law required that all new and renovated apartments be made accessible to the disabled while the federal standards required only that 5 percent comply. The Fair Housing Justice Center made a survey in 2006 of 14 recent buildings and found that all had interior doors that were too narrow, thermostats that were too high and not enough clear floor space in bathrooms and the center referred their findings to the U.S. Attorney. This important dispute, however, apparently is about the insides of apartments and does not address the very widespread existence of step-up and step-down entrances that can prove difficult for the disabled. Low-angled ramps can provide a viable alternative to steps but they are few and far between. The Carlyle Towers mixed-use building at 115 East 87th Street, for example, has a school on its lower floors on 88th Street and a large, landscaped plaaz on 87th Street with a nine-step entrance. The building, however, has a very long ramp to the west of its raised entrance, set back behind its extensive sidewalk landscaping. The street-side of the ramp has a brick wall that is quick visible but only a couple of feet high. 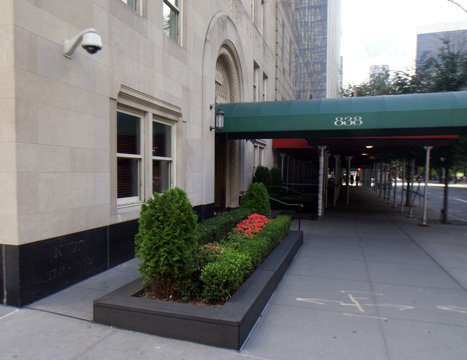 A more discrete access ramp exists at 838 Fifth AVenue on the southeast corner at 65th Street across from Temple Emanu-El. Its entrance is only two short steps up and the ramp is next to the building and behind a low hedgerow. A more visible disabled access ramp can be found on the north side of the 4-step-up entrance to the Bretton Hall apartment building at 2350 Broadway between 85th and 86th Streets. It is relatively short in length with a decortive, cast-iron railing. Some commercial buildings have similar access concerns. 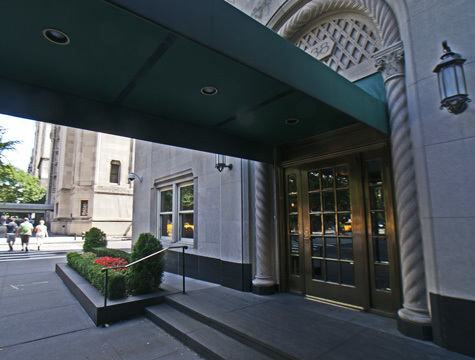 At 40 East 52nd Street, which was erected in by the Rudin organization, the large, elegant lobby extends through the block to 53rd Street, which is several feet lower than 52nd Street. There are two broad sets of stairs in the lobby but the east side of the lobby has two "loggias" with gentle ramps forthe disabled. The problem often does not end at the front door as often older buildings have more stairs in their vestibules and/or lobbies. The building at 838 Fifth Avenue was converted in 2001 from an 11-story office building into a 10-unit residential condominium project by Albert A. Taubman, then the chairman of Sotheby's, the auction house, and the Taubman Group, a leading developer and owner of shopping malls, and Louis M. Dubin, who is Mr. Taubman's son-in-law, and Metin Negrin, both of the Athena Group. In a March 3, 2000 article in The New York Times, Rachelle Garbarine wrote that, according to Bret S. Bobo, the sales director for the development, the developers were "drawn to the building because 'it was the only opportunity left in a prime location,' on Fifth Avenue with Central Park frontage between East 60th Street and the upper 90s, 'to convert to condominiums.'" The apartments range in size from 4,522 to 5,423 square feet aned in price intially from $9 million to $18 million. The building was designed by Harry M. Prince in 1950 for the Union of American of Hebrew Congregations and Mr. Taubman, Mr. Dubin and Mr. Negrin expanded it in the conversion by adding one floor and a 10-story addition on 65th Street. "In October 1998, 838 Associates bought the building for $30 million from the Union of American Hebrew Congregations, which moved to 633 Third Avenue at 40th Street. Though the union first sold the building through a sealed bid to Beit Yaakov, a Sephardic congregation, which had wanted to rebuild it as a synagogue, that sale never closed, and ultimately the building was sold to the development group. To create the apartments the developers envisioned, they also purchased, for $7 million, the adjacent property at 2 East 65th Street, which has been razed, and combined it with the 20-foot-deep rear yard behind 838 Fifth Avenue to provide room for the 10-story addition. A 12th floor will be added to the original building to form the penthouse. The project was granted a certificate of appropriateness from the Landmarks Preservation Commission," according to Ms. Garbarine's article. Most of the interior of the former office building was demolished and reconfigured to apartments with nine-foot-high ceilings. Schuman Lichtenstein Claman & Efron designed the apartment layouts that include corner living rooms of up to 47 by 20 feet and libraries with wood-burning fireplaces. The building has a rooftop terrace and Beyer Blinder Belle, the architects for the project, clad its exterior of the addition with limestone from the same quarry as used on the Fifth Avenue building. The Fifth Avenue facade of the building has a prominent inscription: "Love Thy Neighbor as Thyself." On the sidestreet is another facade inscription that states "Do Justly Love Mercy Walk Humbly With Thy God." The top of the building was arched and some observers have noted that it the whole facade resembles a stone tablet. The building has seven ground-floor studio apartments for staff members, measuring 257 to 339 square feet and selling - but only in conjunction with the purchase of a larger apartment - for an average initially of $500,000 each. Nine 45 square-foot wine cellars and 15 storage units, with 30 to 111 square feet, are be in the basement.